Megan decided on Northwestern after attending a campus visit day and being overwhelmed by the hospitality and genuine concern for students’ faith she witnessed. A member of the A cappella Choir, Symphonic Band and Heritage Singers ensemble, Megan graduated with a degree in music with endorsements in elementary and secondary education. 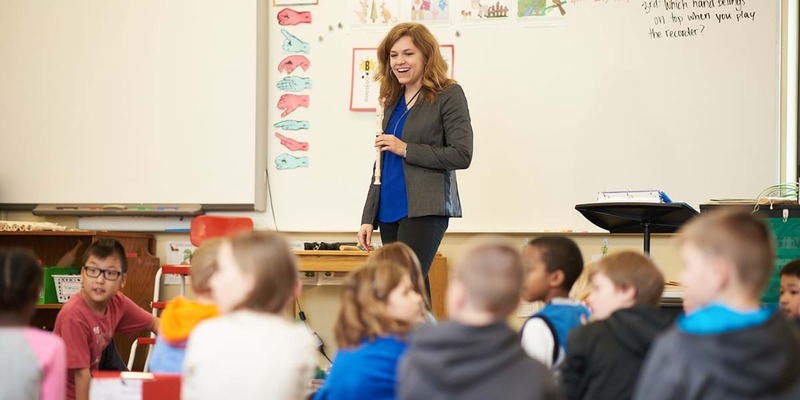 Now, as one of just two music teachers in her school, she teaches preschool and elementary general music and directs the junior high and high school choirs, as well as an a cappella group. What are some of your favorite memories from Northwestern? My spring break trips every year definitely make it to the top of my list. My freshman and junior years I went on Spring Service Partnership trips to Kentucky and the Netherlands. The other two years I went on tour with Northwestern’s A cappella Choir. It’s hard for me to think of a better way to spend 10 days than singing songs around the country with some of my favorite people. Each trip was special and life-changing and taught me more about God and his people. How did your music studies strengthen your faith? When I came to Northwestern, I brought with me a desire to become a better musician, but I also carried with me the weight of disappointments and missed opportunities in music. As a senior in high school, I had placed my identity in honor choirs and contest ratings. Through friendships within the music department and the Lord’s hand through music, God restored my confidence in music. Music has always been a solace and inspiration for me. I think that’s why I’m so passionate about sharing it with others, so that they can experience Christ’s love and peace in that way too. What did you appreciate most about the music faculty? I appreciate so many things about the music faculty—the way they helped me identify my calling as a teacher; how I could stop by their offices at any time for help on coursework or to chat about life; the fantastic ensembles I played and sang with; the aim of the department to glorify God and share his love through music. They really encouraged me to push myself and develop the gifts God has given me. How has Northwestern prepared you to become a successful music teacher? During my first semester at Northwestern, I learned so much observing and teaching in area schools as part of my various practicums. My music classes and ensemble experiences helped me with the music part of my degree, while the education courses helped me hone my teaching skills. Of course, student teaching with elementary and high school students really brought it all together. As a senior, I was the rehearsal assistant for Dr. Holm, the choir director. He really encouraged me to expand my experiences by leading warm-ups for the community choir and directing the women’s song on our spring break tour that year. I was also a tutor for a few music classes and gave voice lessons for students in voice class. Those experiences helped prepare me for teaching in my own classroom. My goal has been to fine-tune different skills at each grade level and continue developing meaningful relationships with my students. Within the next five years, I'd like to earn a master’s degree in either music education or choral conducting. Someday I can see myself directing college choirs at a Christian college like Northwestern.